Blue is a hue fitting for exceptional life occasions, standing handsome and bright, yet cool and uncomplicated. 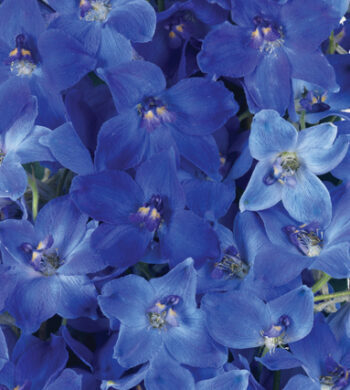 This delightful display has two blue favorites, billowy hydrangea in a lovely lighter shade and deeper darker delphinium with husky depth. Ridged and proud white roses and playful green spider mums add their uniqueness to the mix, our glass vase makes the look even more posh and breathtaking. 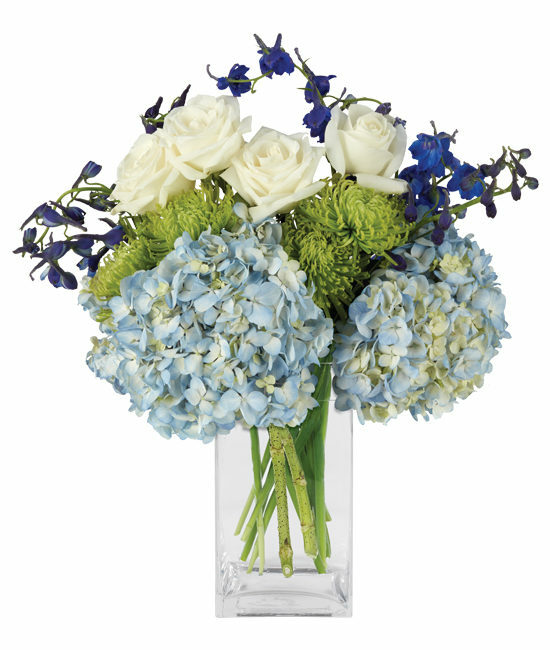 “BB” for short, makes for a lovely bouquet to add a pop surprise in your life. Remove all foliage that will fall below the water line. Remove the “guard petal” on each rose – this is the outermost petal left on to protect the bud during shipment. You may also remove any petals that may have slightly bruised during shipping. Hydrangeas may look a bit tired upon arrival. Don’t despair! They’re healthy – just thirsty…they will rehydrate and perk up within 24 hours. We recommend cutting all stems underwater for best blooming results. Add fresh water daily and re-cut stems every other day.